Everything that gets used regularly gets worn out. Covering furniture and other tips might help, but everyday use wears and tears your furniture. Still, this isn’t a reason for concern. There are a number of techniques that can be applied when dealing with old furniture, before throwing it out or paying handsomely for professional restoration. Sometimes it will be necessary to get professional help, but until then, here are some DIY tips you can try out to refresh your furniture looks. Every material is different, and some things can be applied only to certain materials in a certain way. Damaged plywood can be way more difficult to address than damaged hard wood. Plastic furniture, on the other hand can be maintained and restored easier. When dealing with leather, you should also be very careful, for it can be tricky to work with. When dealing with plastic, best way to approach it is to clean it properly first. Combination of ¼ cup of bleach added to a gallon of hot water gives best results, and takes off all of the removable stains. Once you’ve finished, wipe it off with a dry cloth to take all of the bleach out. With a lot of plastic-based paints you can refurbish your furniture and give it a completely new look. With stained leather, best results are gained when using a combination of saddle soap and warm water. Saddle soap can be bought in any shoe store and combined in 1/8 ratio with the water, it should be gently rubbed over the stain. Rinse the leather properly and let it dry. Don’t try to use heaters or hair dryers, because they can dry out and crack the leather. Before you start restoring something, you should first take in to consideration one thing – does it pay off? There are a lot of ways you can try to fix something, and sometimes you will need professional help. Sometimes, the damage is unrepairable, and though it might seem hard – you will have to replace that piece of furniture. With internet, countless opportunities arrived. Today you can check for furniture restoration tips with professional restoration specialists in just few clicks. Some even provide free assessment via video calls and photos of your furniture. There’s a sea of website furniture stores you can check out, and also a number of DIY restoration communities that can help you make a decision of whether to contact professionals, or try to finish the job alone. First and the most important step to any reparation and restoration work, is proper cleaning. Before anything else, the piece of furniture you’re addressing has to be clean and dried. Best way to approach this is to combine warm water with some type of vegetable-oil based soap. You should use a toothbrush for more detailed parts. You can use toothpicks, or any other sharp and thin object to dig out the stubborn dirt, but be careful not to damage the furniture while using it. You should finish off with a very fine steel wool and a non-abrasive cleanser. Once cleaned and dried, it’s time to address those nicks, dents, stains and scratches. There’s a few ways of doing this. These rings from glasses can actually be removed in a very simple and cheap way. Take some mayonnaise and spread it in a thin layer over the ring. Leave it there for about half an hour, and then wipe the piece of furniture off. The water ring should disappear with the mayo, but if it doesn’t work at first, you should repeat the process. Best way to remove stains from the furniture is to make a mixture of ¼ cup of canola oil and ¾ cup of vinegar. Apply the mix to the cotton cloth, and rub it in circular motions on the stain. This should not only help you remove the stain from the furniture, but it should also help your furniture get a new natural glow. With dents in your wooden furniture, there’s a simple trick you can try out. Pour some water over the dent, and place a towel, shirt or a sheet over all of it. Place the hot iron on the cloth and wait a bit. Water gets absorbed by the wood quickly, because of the heat from the iron, and after few minutes, the dent should be gone. Best way to revitalize your furniture piece, according to Antique Restoration Sydneyexperts, is to rub and buff your furniture with any type of furniture oil, after you’ve cleaned it. You should apply the oil and let it soak in, and you should repeat this process several times, to get the best out of your furniture piece. 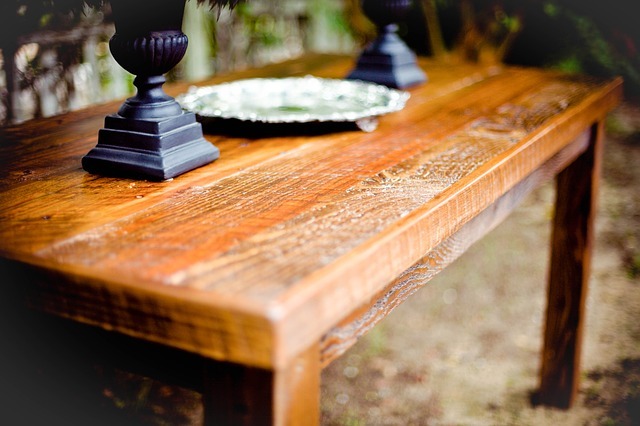 Using Tung oil, and fine steel wool, your furniture should get a new, refurbished look, and with just a bit of wax you can make it really stand out. Wrap Up These are just some of the tricks and tips you can apply when dealing with furniture restoration. Everything has its expiration date, but these tricks can help you maintain and restore your furniture, give it the new looks and save you some money. Of course, sometimes professional help will be necessary, but it’s important to know you tried your best on your own. Aside from being a DIY enthusiast, Ian could be tagged also as a passionate sports fan, nature and photography enthusiast, always trying to keep up to date with tech innovations and development.